Andrew Norman’s Play, “a symphony in all but name,” has already made waves: critic and musicologist William Robin sparked a lively online debate last winter by suggesting that Play “might be the best orchestral work that the twenty-first century has seen thus far,” and it was nominated for a Grammy for Best Classical Contemporary Composition earlier this year. 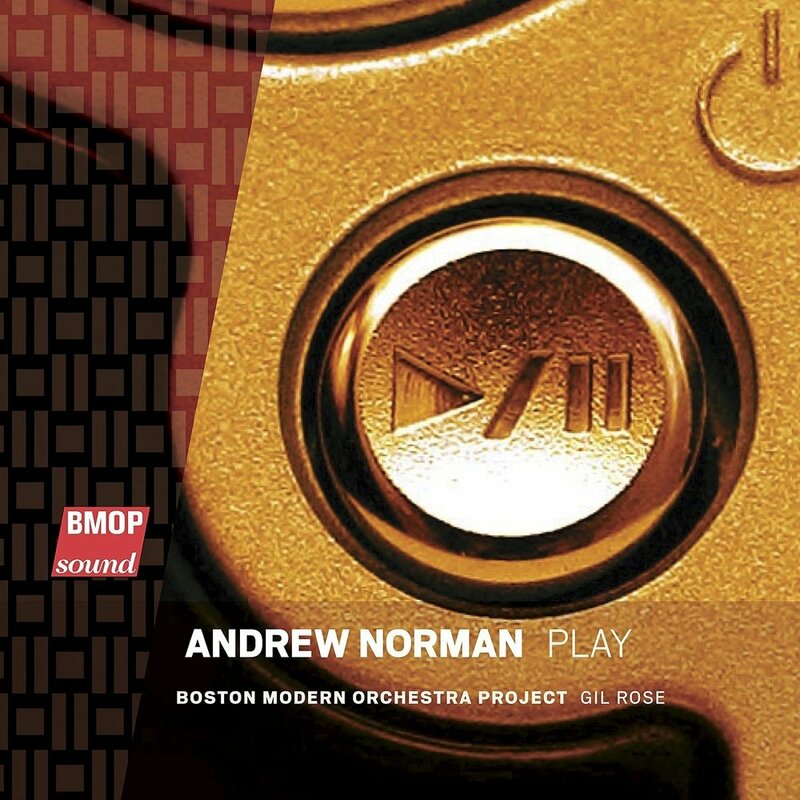 Commissioned and recorded by the Boston Modern Orchestra Project (BMOP) in 2013, the work has since changed substantially due to Norman’s insistence upon clarifying his ideas and learning from his experiences working with different musicians in each subsequent performance. Just named Musical America's 2017 “Composer of the Year,” Norman has won both the Rome Prize and the Berlin Prize, the Guggenheim Fellowship, and was a finalist for the Pulitzer Prize in Music in 2012 for his string trio The Companion Guide to Rome. This essay is the result of many years of close collaboration with Norman as a performer, interpreter, and scholar. Because of that, rather than give a general profile of his career, as is typical in this series, I will focus on Play, and through this focus on a single work touch on some of the aspects that inspire me about Norman’s music. He graciously took time out of his schedule while finishing the final revisions for Play last month to jump on the phone for an interview to illuminate some of the elements of the piece. My mind flashes to the escalator of the Centre Pompidou, riding up the outside of the building slowly as Paris reveals itself in layers of rooftops, threads of pedestrians. I happened to be in Paris this summer during Fête de la musique, an annual festival of music outdoors that feels more like an Ivesian maze of drum circles and Indie rock bands. Needing a respite from the chaotic buzz of the streets, a friend and I went to the opening of an exhibit at the Centre Pompidou on the Beat Generation. Entering the dimly lit exhibit, we found each artifact a treasure: the long single scrolled manuscript of Jack Kerouac’s On the Road from 1951 almost filled the length of the main room sprawled out in a long glass case. The audience will have a chance to see what Norman is doing live on October 28 when the Los Angeles Philharmonic premieres the revised version of Play, his celebrated first symphony. Structured in three movements—or “Levels,” as they are titled—it is an intricately planned work dealing with themes of control, free will, hidden messages, and of course, playfulness. The key elements of Play are the things that inspire me in Norman’s music: physicality, the use of form to create narrative, and an interest in the experience of live performance. For me, instrumental music is all about the combination of physical gesture and sonic event.... There’s a very strong physical gesture and it makes a very interesting musical sound.... They’re inseparable in a way, and I often think about these gestures in terms of the physical impact they’re going to have, the visual impact. Breaking this jargon down, “extended” implies “advanced,” “broadened,” or “furthered,” all terms to describe expanding the palate of sound available at one’s disposal, or thinking beyond what one conceives as boundaries. In the classical contemporary music scene, the term “extended techniques” is used to define the broad range of techniques demanded of performers in twenty-first century music. A look into standard notational practice for canceling out these techniques gives further insight into issues of terminology. Elaine Gould’s Behind Bars: The Definitive Guide to Music Notation states: “Non-standard techniques may be cancelled by any of the directives as follows: ord. (modo ordinario), nat. (posizione naturale), norm. (posizione normale).” By contrast, normative practices for playing string instruments involve drawing the bow across the strings to utilize the maximal resonance of the instrument and create a “pleasant” tone. Similar to Lachenmann’s approach to discovering sounds through tactile experimentation, Norman developed and chose the extended techniques for Play by working out the sounds on the viola, one of his primary instruments. Norman’s personal connection to playing the instruments that he writes for gives him a unique perspective and results in stunning timbres and dramatic physical gestures in his music. Occasionally in our phone interview last month he would suddenly demonstrate a passage by singing and playing the piano, or burst into vibrant chords on the viola. From the other end of the phone, these sounds seemed to be an extension of Norman’s voice, appearing as a part of his creative process and his expressive train of thought. This physical connection to the instruments makes Norman’s string writing especially compelling and natural. Sometimes there is a one-to-one correlation between a physical gesture and the kind of sound it produces, i.e. a big dramatic gesture produces a big dramatic sound. But I also love when there is a contradiction, a disconnect between what is seen and what is heard, when a big motion produces a tiny sound, or vice versa. To see the correlation or contradiction apparent in these and other sounds, videos describing the techniques used in the Play can be found at shakennotstuttered.com, a free online resource demonstrating the extended techniques for strings in Norman’s orchestral and chamber works. Unusual timbres such as these recontextualize ordinary playing, beautiful in their directness or in their subtle intimacy. As an audience member, this means being open to hearing these various sounds in the same body of work, and finding a way to embrace their contradictions and juxtapositions. In his essay “Philosophy of Composition,” Lachenmann emphasizes the need for “a mode of listening that constantly renews itself through reflection, and which must show equal proficiency in dealing with familiar and unfamiliar sounds alike...” New sounds force one to be present in the physical world, often sonically making the listener uncomfortable. They also reframe familiar sounds, provoking the listener to hear and consider beauty in a new context. I really love seeing people make choices and taking risks on stage...to take a risk, to have a definite idea about the interpretation of a piece.... To me, the heart and soul of written music is about creating something with enough depth and complexity, but also enough openness in it to allow for many different realizations.... And that has also led me into really exploring this idea of human interaction in music. How can I open up that space on the written page for human beings to be human beings when they play music? Norman’s music is thrilling to experience live because of the abundance of unusual sounds that emanate from the stage. Emerging from these sounds is an incredible, slow, lyrical narrative that Norman threads through each piece. The journey of each instrumental line in this narrative gradually unfolds, manipulated by rules of the symphonic game, and blurred by intensely physical extended techniques that challenge traditional concepts of beauty. I really like the idea that a piece would teach you how to listen to it. The piece would show you, in a very purposeful way, the rules of its universe, so that you can follow along with the structural trajectories of the work in real time. I think a lot about the symphonies of Beethoven, and the late symphonies of Haydn. I think about this time at the turn of the nineteenth century when the public orchestral concert, more or less as we know it, came into being, and what's striking to me is the incredible formal clarity of the works written for these concerts. You can almost hear Beethoven and Haydn announcing to the public “and here we are, folks, at the second theme . . . and look here, I take the two themes and combine them, etc.” The formal operations of this music are unapologetically worn on its surface, in an almost didactic way, and that is something that I love and find deeply satisfying as a listener. I also love being blown off course, I love having the rug pulled out from under me, and there’s plenty of that in Play, too—music that seeks to both orient and disorient you in rapid succession. These controls, with names like “fast forward,” “rewind,” “freeze,” “interrupt,” and “try again,” are triggered by specific percussion instruments, and they are essential to the overall trajectory of Play and to an understanding of its internal mechanics. I use specific percussion instruments to amplify, to call attention to, or to externalize the formal operations that have been part of classical music for centuries. There is plenty of “interrupt,” “try again,” and “rewind” in Beethoven, it’s just not labeled as such, nor is it instigated with a woodblock or a bongo hit the way it is in Play. I liked this idea that the percussionists in Play would control, in a metaphorical sense, the goings-on in the rest of the orchestra, because what is an orchestra if not an elaborate system of hierarchical controls? I’m fascinated by who controls whom, and if, when, and how there is free will, or choice, or agency involved in the act of orchestral performance. The concertmaster, in a way, controls the bow movements of their section, but then they are being controlled by the conductor, who is in turn being controlled by the score. And at every one of those levels there’s some element of choice and some element of submission, and I find that absolutely fascinating. While each member of the orchestra is trying to fulfill her individual expectations or desires, the percussionists act as a metaphorical impediment, creating a layer of musical triggers that other musicians must respond to. There is a struggle between the individuals’ desires and the control that is theatrically imposed on them by the percussionists. These control elements or “rules of the game” are presented in rapid succession at the beginning of “Level 1”. Norman provides hints in the score (see chart to the left). One of the most audible “control elements” in Play is the triangle which freezes or unfreezes the action with a resonant ding [click link for audio]. Another example of a percussive sound that triggers action is the slapstick/kick drum combination; this sonorous whack makes the orchestra “cut to a different world.” Norman said this concept was inspired by “the subtle knife” in Philip Pullman’s fantasy trilogy His Dark Materials. In the books, one of the main characters has a magic knife that allows him to slice open the space-time continuum into another world. Sonically, the slapstick/kick drum combination triggers the orchestra to jump to a different world of sound. These rapid, abrupt changes become increasingly prevalent as the work progresses. Adapting a concept from composer and architect Iannis Xenakis, time exists both as an “impalpable flux” that may be abrasive and difficult to hold onto—jumpy, starting and stopping but always moving forward—and in a “frozen form” that is observable using instinct and listening in longer threads, only possible through memory. This second approach to time by using memory allows for formal listening. Both types of listening are important to understanding the narrative trajectory and struggles within Play. Norman said that in the beginning of “Level 1”, “I want to stretch your powers of perception, to throw you down a gauntlet of sound that sits on the edge of unintelligibility...it’s a game for the listener, and a hard one at that, to make sense of this crazy universe, at least at the onset, and that’s part of the fun.” It is only through active listening and memory that patterns, trajectories, and even distinct musical characters begin to emerge. The narrative of Play is driven by characters and their individual struggles, characters embodied by specific instrumentalists in the orchestra (the trumpet, clarinet, oboe, strings). In “Level 1”, the most obvious character that emerges is the trumpet. At one point the action suddenly stops and the trumpet is left alone in a wide downward major seventh, an interval that is threaded through the symphony and that ends the entire piece. This trumpet solo moves in a contracting melodic wedge shape, seeking to focus energy inward. It finally succeeds at the end of “Level 1”, and announces what I hear as a “call to adventure,” as Nancy Duarte refers to it in her book on oratory, Resonate. She says this is when an audience is first made aware of the difference “between what is and what could be.” This trumpet call [click for audio] invites the audience to cross the threshold into “Level 2”, and slowly weaves its way through the entirety of the central movement (see score image below). In “Level 2”, the character of the oboe [click for audio] emerges as one of the main protagonists. It is trying to complete the action of playing a descending melody; however, it keeps falling off course at various points. The trial and error of the oboe’s musical idea—downward melodic motion by whole or half step—is representative of its narrative trajectory. This narrative thread is only resolved in “Level 3” when the oboe finally finds the thing it was always in search of: an uninterrupted descending major scale [click for audio]. One of trajectories I thought of in Play was that of the orchestra gradually losing its free will over the course of “Level 1” and “2”. The players become more and more like puppets or automatons who are just being put through the paces by these percussionists in increasingly frantic and absurd ways. I have this fantasy that the end of “Level 3”, eventually someone orchestra is going to be able to do it without being conducted—just the very end—the idea that even the conductor stops being an agent of control at a certain point, and then it really is people making choices and playing. It is control in an orchestra: by the score, by the conductor, by the concertmaster, that makes orchestral musicians sometimes feel like “automatons.” Several years ago when I originally interviewed Norman (which happened to be the same summer that he was writing the wedge that made its way into Play), he lamented that orchestral musicians often have a negative view of contemporary music. “One thing I’ve heard over and over from orchestral musicians is that they don’t like playing new music because it makes them feel like automatons.” Hearing Norman use that word again in our most recent interview when speaking about the essential nature of Play, and his interest “for human beings to be human beings when they play music” makes me think he really listened, that he really cares about orchestral musicians as people, and that that narrative found its way into Play. a symphony in all but name—that explores the myriad ways musicians can play with, against, or apart from one another. It weds traditional symphonic logic to the non-linear narrative techniques and exuberant tone of a video game, and it dives headlong into the potent theatrical possibilities inherent in the physical gestures of live orchestral playing. Live orchestral playing. Perhaps Gustavo Dudamel, who will lead the premiere of the new version of Play, conjures images of wild hair and dramatic gestures (the ostensible inspiration for Gael García Barnal’s character on Mozart in the Jungle), but the physicality of the orchestral musicians themselves is rarely discussed. For me, live orchestral performance is about people as much as it is about sound. It’s about interpersonal interactions as much as it is about sonic events. I think we should be talking about orchestral music not just as a combination of melodies and harmonies and rhythms, but as an act of performance, of performance art really. These days, when we can produce any imaginable sound on our laptops, what makes the orchestra interesting, and vital, and necessary, isn’t the sounds it makes but the very human energies and human expressions it unleashes. Traditionally, each section of stringed instruments plays exactly the same part. However, Norman splits the sections into individual parts, giving each player her own voice. In an unusual gesture, but one that is pervasive in Norman’s orchestral writing, members in the back of the string sections take on non-traditional roles as soloists. Esprit Orchestra regular Renee London, who had one of the more exposed violin parts in the Canadian premiere of Play this past season, said that while she was surprised to discover she had extremely exposed solos in the back of the section, she loved that “I could actually play my heart out!” Being a good section player in an orchestra, especially in the back of the section, usually means not sticking out, and therefore prioritizing blend over individuality. ...reiterating the players as individuals, I was thinking how the piece reflects a utopian economy where individuals interact with a larger system. When I saw BMOP do [the premiere], I recall how the solos given to the last chair was really moving for some reason [sic]...like there was a feeling of freedom and also fairness happening. Playfulness and physicality are ultimately used to enhance the “characters” that are individual orchestral musicians in a narrative, personalizing the orchestra and highlighting human interaction that is unique to live performance. In “Level 3”, the orchestral musicians finally achieve their unified goal to create the wedge with their individual threads, unimpeded by the control elements or their own missteps. Yet the piece does not end big and does not finish with a satisfactory climax as one might expect. There is still something left unresolved by this final section. The last interval of Play is an expanded major seventh: after hearing the wedge so many times throughout the piece, it is clear that this is the logical end of the idée fixe. It now sounds pleasant, even though in traditional classical music, it is an interval that would be considered “dissonant.” The piece ends with a call to action: the audience must resolve this dissonance in themselves.